Europe is the perfect place for a getaway. With its close proximity to the UK, exceptional medical care and not to mention some of the most breath-taking cities, what better time to go and explore than Valentine’s Day! We couldn’t talk about romantic getaways and not mention Paris- the city of eternal love. For a truly magical trip, why not visit the most romantic destination in the world? With its cinematic décor and eternal charm, you’ll be sure to create unforgettable moments you can cherish forever. The beauty of Paris is in everything, from the simplest walk to a candlelight dinner, romance is everywhere – it must be something in the air. If you fancy a night of luxury, why not enjoy a dinner cruise on the Seine, sailing down one of the most renown rivers in the world. You and your loved one can relax, enjoy some bubbly (within reason) and watch the lights, accompanied by a delicious classic French 3-course meal. There is wheelchair access on the cruise, plus you don’t have to worry about transport, you’ll have your own chauffeur to take you to and from the boat. If you’re a chocaholic then this next ones for you- a chocolate and pastry walking tour! Stroll along the cobbled streets visiting the finest chocolatiers in the city. Indulge as your personal expert guide, enlightens you on the history of Parisian chocolate. For the ultimate romantic experience why not discover Paris in a helicopter. Fly over famous Parisian monuments like the Eiffel Tower, Notre Dame, and the Palace of Versailles whilst sipping on a glass of champagne. Enjoy the breath-taking view of the Parisian skyline, and let the beauty of the city speak for itself. Venice- a city that will both surprise and entertain you. We recommend five days minimum to really soak in the sights and appreciate the true beauty of the city. 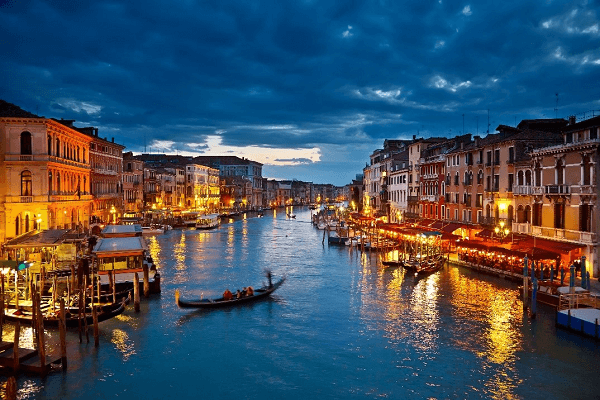 It is claimed that Venice is a place for passionate lovers, with the ability to bring out the romantic side in anyone. How about a stroll along the Bridge of Sighs, a place of real historical significance? Or perhaps you would prefer a gondola boat ride through the canals of the city. This is the perfect opportunity to see many of the sights Venice has to offer. As you’ve probably noticed Venice is a place for those who adore history, from the National Archaeological Museum to Palazzo Mocenigo, you will be left fascinated and in awe. After a long day of sightseeing, we suggest venturing down one of the well-known alleys to discover the best Venetian dishes, from bigoli in salsa to baccala mantecato- you won’t be disappointed. Prague- a city which can only be described as a living fairy tale. With its stunning castles, cobbled streets and baroque gardens, not to mention its amazing shopping district, you will be stunned at what this beautiful city has to offer! How about a romantic stroll through the Petrin Park and perhaps even a visit to the observatory tower to uncover the wonderful views of Prague? Or if you’d rather explore the city via boat, then why not dine on a night cruise, enjoying a delightful 3 course meal. As with any new city, there’s a range of delectable treats to try. 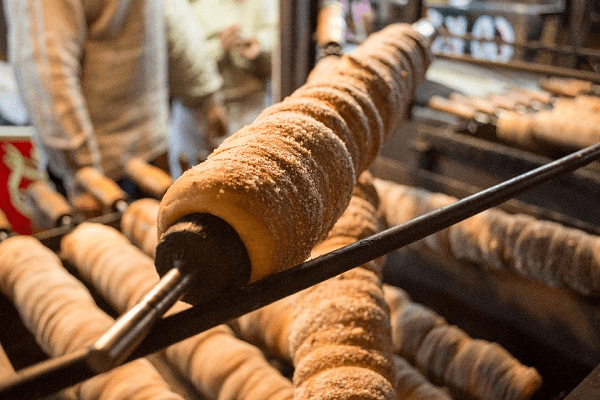 We suggest trying a chimney cake, a pastry common in countries including the Czech Republic. They consist of a dough cooked till golden brown and brushed with butter, or rolled in cinnamon and often filled with melted chocolate. If you love to shop, you’ll love Prague. The old town is the main shopping district with boutiques and small shops located around the streets near Wenceslas Square. If you feel like a splurge or just to window shop, then Paris Street will be the one for you, housing a variety of international designers. As the Old Town is on the other side of the river it provides the perfect opportunity to walk across the Charles Bridge, a famous Prague landmark. 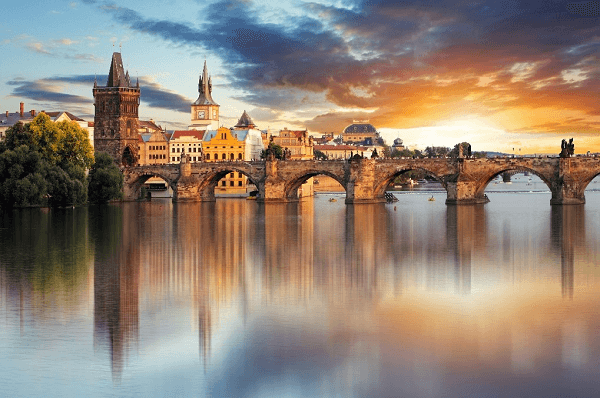 Built in the 14th century, it connects the Old Town with the Lesser Town, not to mention the incredible view from the crossing of Prague and the Vltava River- we recommend watching the sun set from the bridge for a truly romantic experience! We’re talking about Rome again…we just can’t seem to get enough of it! Rome and romance- they go hand in hand. Known as the eternal city for its unrelenting nature and desire to thrive, what better place to spend Valentine’s Day than the place where it all began? Rome is a city full of history and beauty, for that reason we recommend at least a week as your itinerary will be packed with things to do and places to see. From Vatican City which has an exceptional standard of aesthetics (from architecture to décor), to incredible food such as Porchetta and Pizza al Taghlio, Rome has it all. Given that the city is mainly flat, it is very accessible, meaning you can explore at your leisure and with ease. Perhaps one of the most renown sights in the city is the Trevi Fountain. Its reported that each year £1.3 million is fished out of the fountain, however don’t be quick to throw all your change in. According to local tradition each coin has a different meaning. The first coin promises returning to Rome, the second indicates a new romance, and the third suggests marriage… so really think about what you wish for! Set over the Tiber river is the Ponte Milvio bridge, an integral part of roman tradition. Here, couples have the opportunity to lock a padlock, symbolising their love for one another to a lamppost on the bridge and then throwing the key into the river. What better way to create a memory than to be part of something that will be there in years to come? When we think of Italy, we think of gelato, and the good news is it’s sold throughout Rome. The simplicity of going to an ice cream shop with your loved one and strolling through the streets sharing Gelato is perhaps one of the most romantic ways to spend your day. These cities are guaranteed to steal your heart so book your 2019 Valentines getaway today! We provide full cover for a wide range of medical conditions and offer a unique approach to your travel insurance, so what are you waiting for? Click here for more information.